I would have to say that the 'Lower Sac', that section of the Sacramento River below the Lake Shasta Dam, are my home waters. I remember fishing it as a kid. 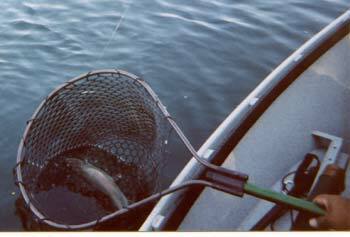 Later in life, before I became a fly fisherman, I could usually be found fishing in and around Redding. Last weekend I had reservations for a day on the river with a guide from The Fly Shop. I had assumed that we would fish the usual waters, but instead we fished from the trailer park down to Ball's Ferry Bridge and takeout. The river in that area is comprised of channels cut through limestone with lots of deep pools and intermittent shallows. I wasn't sure what to expect other than good fishing. We saw salmon starting to spawn and were glad that we hadn't planned to wade the river. The redds are fragile enough, and they don't need someone walking on the eggs. We dropped in at the trailer park, pulled upriver a bit and anchored. The standard rig here is an indicator with ten feet of leader material and two bead head nymphs. The guide's choice for this day was a size-14 Prince nymph on top and a size-20 Macro nymph on the bottom, with a couple of AAA split-shot on the line. Maybe it was because the salmon were only beginning to spawn or due to our choice of flies, but any twitch of the indicator was a strike and reason to raise the rod tip. There were times when I struck and knew instantly that the fish was on, while other times I was getting on the reel not sure that the fish was still there. All morning went on like that. We began at the I-5 bridge, fishing the big holes just above and below the bridge. This area kept our attention for almost two hours. The majority of fish were fourteen to eighteen inches. All were brightly colored fishundefinednot spawning colors, but bright with good-looking rainbow stripes down their sides. One of the nice things about that stretch of water is that it is one bend removed from the freeway so there are no traffic sounds. One is alone with the river, just the water's burble and birds' tweeting. We found fish in practically every hole that we floated over. Fighting fish all morning made for big appetites. I was glad when we stopped for lunch. The sun was past high; the temperature was a balmy 60–65 degrees. Our reward for battling the Sac's trout was a large sandwich, diet Pepsi, potato chips, and a couple of cookies. Fishing was much of the same after lunch, except that I caught a sucker about two feet long. It went back in the river, and right after, Bobbie [Armor] caught a small steelhead. That might have been the highlight of the trip. The fish turned out to be only about fourteen-inches long, but it had lots of fight. There wasn't any feeling that it was going to stop, even after it was netted! Soon after that the sun seemed to just drop in the western sky and with it, the temperature. There had been frost on the windows that morning, and this evening gave every indication of another cold night. I was glad to be getting off the water by the time we pulled the boat onto the trailer. Another successful day on the Lower Sac, my home water! It was such a great day that I have already booked another trip on January 3, 2004 to kick off the New Year. 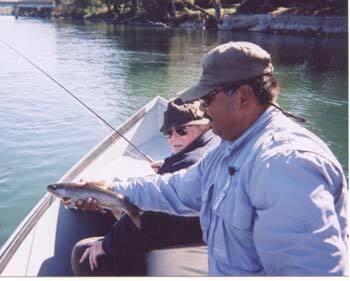 If you are interested in fishing the lower Sacramento around Redding, call the Fly Shop for reservations at 800 669-FISH.